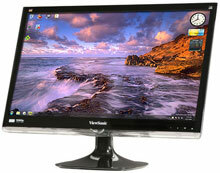 The ViewSonic VX2450wm-LED has been discontinued. No direct replacement is available. ViewSonic"s VX2450wm-LED features an LED backlight 24" (23.6" viewable) widescreen monitor with up to 50% energy saving compared to a regular 24" monitor. Environmentally friendly mercury free VX2450wm-LED offers a Full HD 1920x1080 resolution, 5ms response time, 20,000,000: 1 MEGA dynamic contrast ratio, digital and analog inputs and integrated stereo speakers. Ideal for both home and office with the piano black finish, VX2450wm-LED can be mounted on a VESA compliant stand or wall mount bracket. It also has an automatic aspect ratio adjustment so when your input is a 4: 3 signal, the image will not be stretched but instead it will be positioned in the middle of the screen with side bars. 3 year limited warranty, industry"s best pixel performance policy and Windows 7 certification make VX2450wm-LED a great long term investment.